Not to be confused with Flurry. Flurrie (also known as Madame Flurrie) is Mario's third party member in Paper Mario: The Thousand-Year Door. She is a wind spirit, as well as a slightly pompous retired actress who eventually resumes her career at the end of the game. Her face resembles Wendy O. Koopa, while her hair resembles Ludwig von Koopa's hair. Her ability is to blow out large amounts of wind, as hinted at by her name, which comes from "flurry", meaning a small burst of wind. In battle, her wind attacks can make incoming enemies dizzy or blow away flaps when in the overworld to reveal hidden objects or passageways, similar to Watt from Paper Mario and Fleep in Super Paper Mario. Prior to meeting Mario, Flurrie was a famous actress. She was very well-known with fans all over the world, and starred in plays such as "A Mid-Winter Day's Nap". Weary of the spotlight, she retired to a house in Boggly Woods, where she become a friend of the local Punis. When Mario, Goombella, Koops and Punio go to the Great Tree, they find that the door is locked. Punio recalls a secret entrance somewhere around a low branch of the tree, but it is covered by an "invisible thing", and he doesn't know how to remove it or even exactly where it is. He suggests that Mario should go to Flurrie's house and ask her to help them find it. When they go to Flurrie's house, she tells them that she can't be seen without her Necklace and asks Mario to get it back for her. They return to the first area of the woods and find the Shadow Sirens with the necklace. 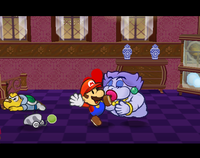 Mario defeats them and gets the necklace back for Flurrie, who insists she must repay Mario and gives a very large kiss which knocks away his current party member and Punio. She then joins the party. At the very end of the adventure, Flurrie becomes a top-class actress once more, now alongside Doopliss. Flurrie creates a play aptly titled "Paper Mario" about the past events in the game. Flurrie plays herself, Doopliss plays Mario (and possibly some others), and the rest of the cast are themselves. Strategy-wise, Flurrie is considered to be the best defensive partner. She has very high HP, can recover HP each turn (though only hers) with Lip Lock and has an attack that pierces defense, which makes her an excellent option for being put in front of Mario. 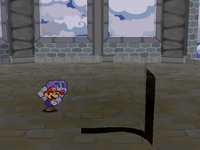 In Super Paper Mario, Flurrie appears as a Catch Card won by winning the Duel of 100 in the Sammer's Kingdom. Her Catch Card describes her as the most "Rubenesque" of Mario's companions, referencing the Baroque artist Peter Paul Rubens, famous for his paintings of large, voluptuous women. Flurrie could also be seen very briefly at the beginning of the game. During the intro, she, and all the other partners from the previous Paper Mario titles can been seen in a photograph. Card Description: It's Madame Flurrie from the last Paper Mario adventure. The most Rubenesque Mario companion ever? How to Obtain the Card: The Duel of 100 in Sammer's Kingdom needs to be completed in order to obtain all Paper Mario: The Thousand-Year Door partner cards from King Sammer. Kurauda Japanese spelling of "clouda". Spanish Claudia A Spanish name, may also come from the word "cloud". French Cumulia Pun of "cumulus", which is a sort of cloud. German Aerona Portmanteau of aero (prefix denoting a connection to air) and the female name Verona. Italian Spirù Pun of spiro, which in Italian means "blow". ↑ "Flurrie is a refined and dignified lady who lives in these woods. The elder says she's a wind spirit who can wield the powers of the air with ease." Punio, Paper Mario: The Thousand-Year Door. ↑ "EEEEEEEEEEEEEEEEEEK! I can't believe I got to meet you, Madame Flurrie! I loved your performance in 'A Mid-Winter Day's Nap'! I've seen it THREE times!" Toad woman in east Rogueport, Paper Mario: The Thousand-Year Door. This page was last edited on January 25, 2019, at 03:23.